And so began a partnership with Club Car that has realized countless new projects, tons of exciting opportunities, and a storied brand refreshed and ready to grow into a new era. How did we get here? In the mid 2000s, Kreber completed a digital project for Club Car’s parent company, Ingersoll Rand. A few years later, we connected with the Club Car marketing team at an Adobe Summit (Kreber was a sponsor). The team remembered our earlier work, and was ready for a transformation. But first, they had a new product to launch. 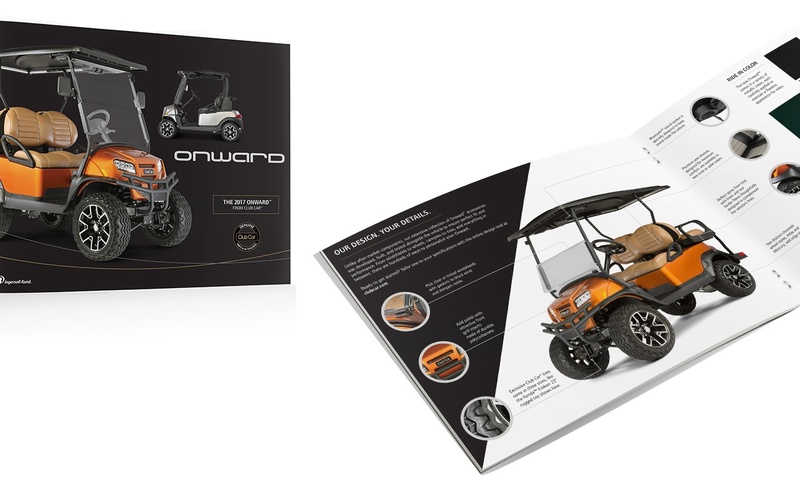 Between November 2016 and January 2017, we worked furiously to help the company introduce the Onward, a personal transportation vehicle, through its dealer network. The goal: drive advance orders, then exceed consumer sales expectations. In just the first quarter of 2017, Club Car did both. Going Beyond "Par for the Course"
After collaborating with the consumer team on a successful product launch, the Club Car Golf division asked us to help tell its story to a new generation of golfers. Under new marketing leadership, the company was eager not just to increase sales, but to become “a force for good” in golf overall. To start, we had to understand several things: the Club Car sales channel, a host of new Club Car products, the fleet purchase journey and its decision-makers, and the nature of golf today—who’s playing it, and most importantly, why it matters to them. Our research led to several strategic insights, which informed creative work including key messaging, a fresh look and feel, an on-location photo shoot, and CGI assets. Key among these insights was the notion that while golf has a lot of traditions, its future holds immense promise. The theme “Game for More” become our rallying cry to attract a new audience of buyers and players to the Club Car brand. "Our dealers were applauding, they liked the work so much." Project deliverables went beyond a refreshed brand image. Kreber designed new dealer support materials and web pages for clubcar.com, created a social media calendar (and continues to produce the hundreds of pieces of content needed to support it), drafted “light” papers (our quick-turn version of white papers), and scripted and produced multiple videos for omni-channel use. When the Club Car dealer network previewed these overhauled sales tools, they actually applauded the marketing team for their efforts to bring the brand into a new era.